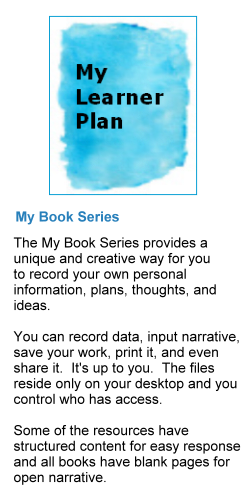 The My Learner Plan is a resource for you to record your learning and skill-building plans and accomplishments. You can enter the titles of the resources you have chosen, date completed, comments, how you are going to use the skills learned in your job, and other comments. This is an ideal companion to the My Development Plan resource. The My Learner Plan provides space for up to twenty-five titles. You can save, print, and e-mail your log to others, such as your manager, for review and comment.